Anti-fatigue design encourages frequent changes in posture, promoting improved circulation. Unique air-filled domes support back and leg muscles conserving workers’ energy up to 50%. Liquid and debris settle between raised domes providing safe, dry footing. 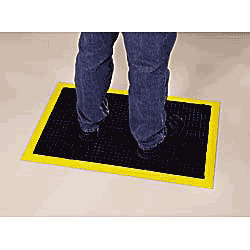 SPECIFY COLOR: BK - Black, YL - Black with yellow border. IN STOCK.